Lake Peipsi (or Lake Peipus) is near Tartu. It is one of the largest freshwater lakes in Europe, with the Russian border running down its center. We stopped briefly for this view. It looks like one of North America’s Great Lakes from here. There is much history along these shores. 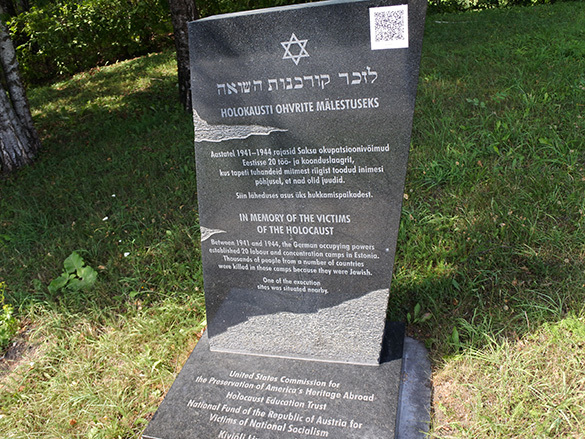 This is the Kiviõli Concentration Camp Holocaust Memorial near our collecting site today. The 20th century history of this region, especially during World War II, is notably grim and brutal. Relatively little has been published on the German concentration camps in Estonia. 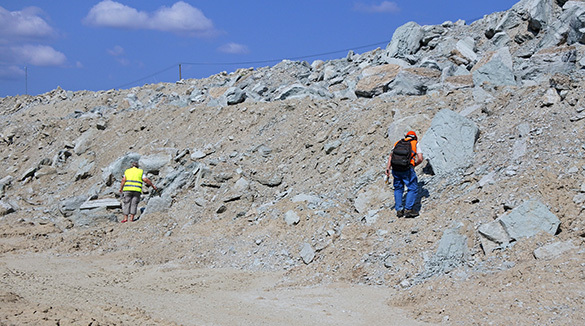 This is the oil shale mine we visited near Põhja-Kiviõli in northern Estonia. The oil shales, in the form of kukersite, are the brown units in the top half of the outcrop. The shales are dug from these pits and then separated from the limestones, which appear light gray. 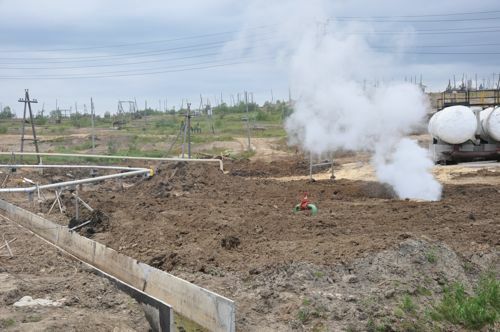 The pits fill quickly with water, so there are massive pumps continually working nearby. 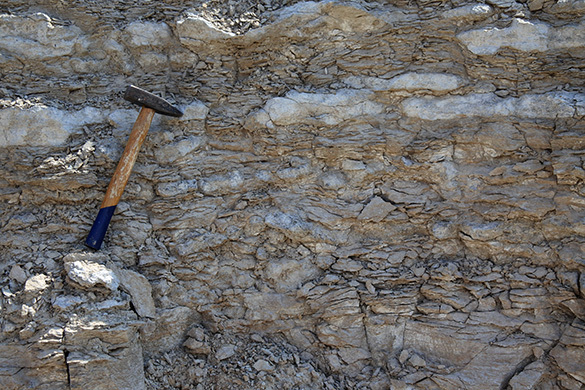 A closer view of an oil shale outcrop. These units are Late Ordovician in age (Sandbian) and nearly unique to Estonia. They are very rich in organic material — up to 55% of the rock. The oil shales are used in a variety of ways for energy and petroleum products. 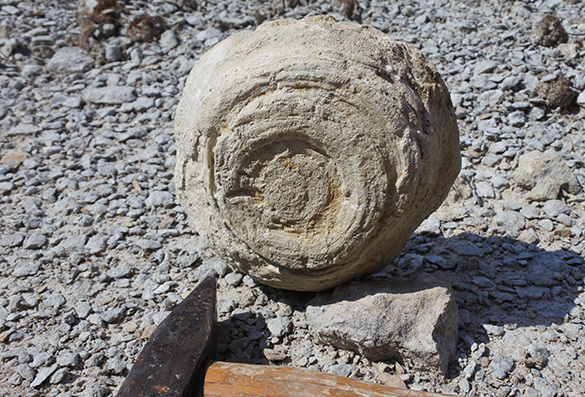 Finding specimens of the spherical rhombiferan echinoderm Echinosphaerites was one of our goals for this trip. Here is one in limestone. The best are those that are in the oil shale because they pop free of the matrix. We didn’t find very many, though. Giant bryozoans were surprisingly common in the oil shales. This is the base of a large trepostome. We found many of these bryozoans with beautiful borings. It was a good collecting site. Here are our delightful Estonian hosts at lunch following fieldwork. From left to right: Olev Vinn (a colleague since 2006), Ingrid Vinn, and Mare Isakar. 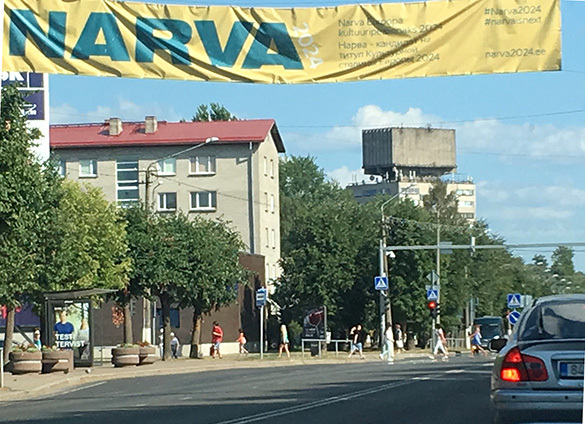 Much to our surprise we were able to go to the storied easternmost Estonian city of Narva. This was very much a treat. Narva sits along the Narva River, which is the border with Russia. 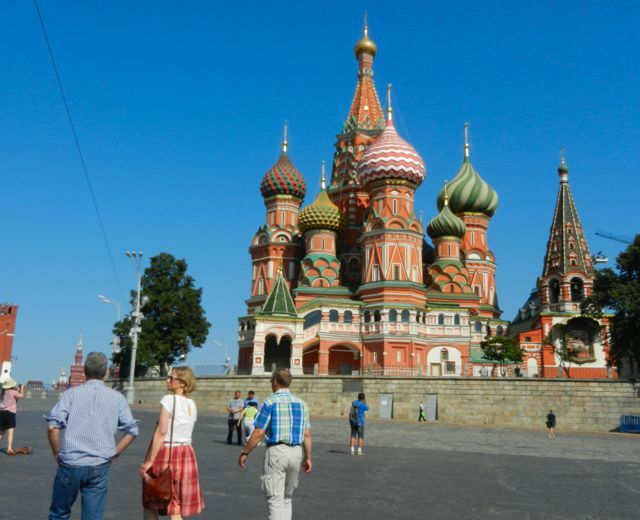 The city has a high concentration of Russian-speakers and a distinct Estonian-Russian culture. Its history has been, needless to say, complex even to present times. 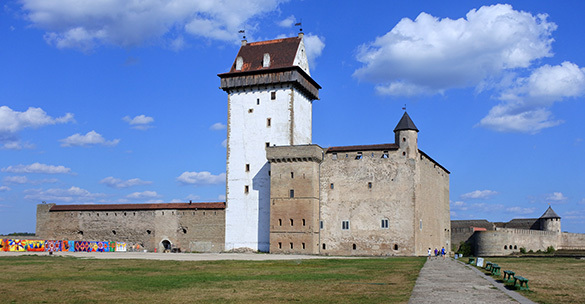 This is Hermann Castle, also called Narva Castle, the focus of our visit. Hermann Castle is the blocky, high structure. To the right is visible another castle on the other side of the Narva River (see below). 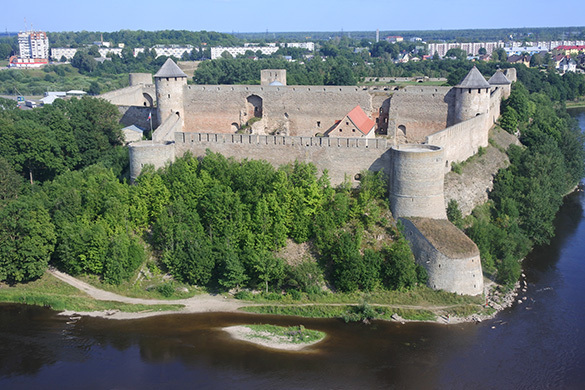 This is that Russian castle opposite the Hermann Castle on the castle on the other bank of the Narva River. It is the Ivangorod Fortress. It makes for quite a striking boundary at the western edge of Russia. 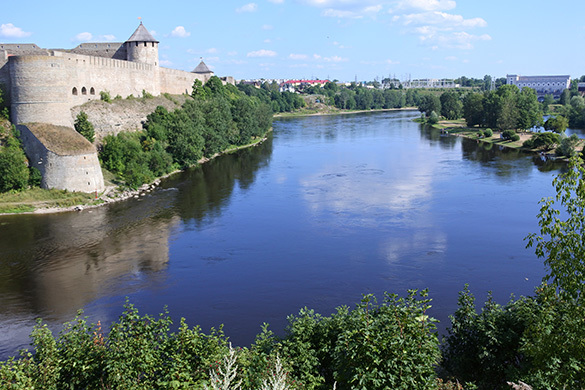 The Narva River between the two castles, looking upstream. The Ivangorod Fortress is on the left. This is effectively the boundary between East and West in Europe. 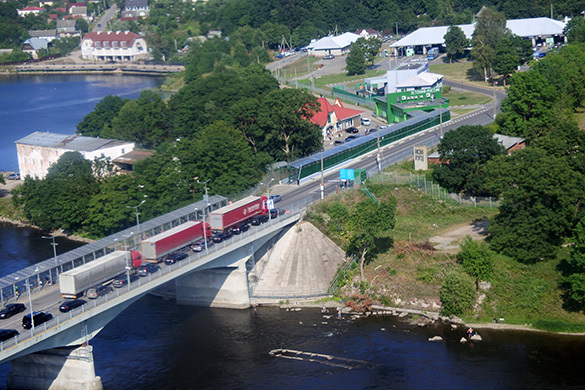 The Narva border crossing bridge between Estonia on the left and Russia on the right. This is the view from the top of the Hermann Castle. At this point my phone gave me a message: “Welcome to the Russian Federation”. The interior of the Hermann Castle is a museum. 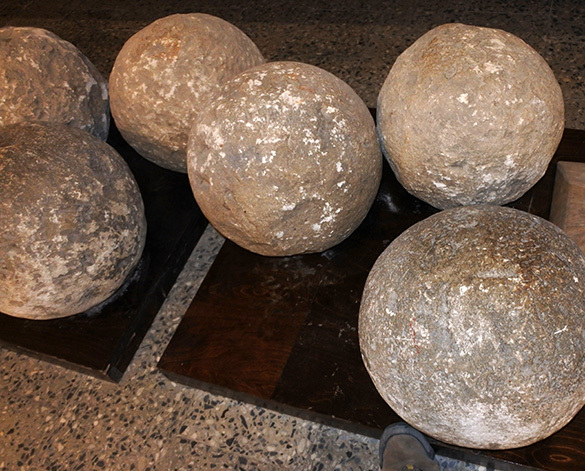 I thought these stone cannon balls were geologically interesting, considering that earlier this summer I saw their equivalents in Wales. Note my foot for scale. 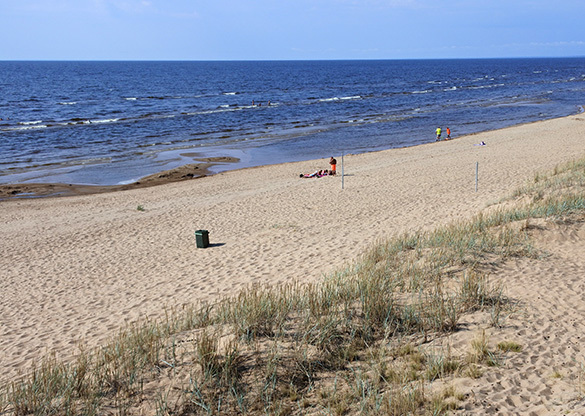 On the way back to Tartu, we visited the town of Sillamäe on the Baltic coast. During Soviet times factories in Sillamäe extracted uranium oxides from local oil shales and then from other ores mined throughout the Soviet Empire. Because of the high concentration of scientists and engineers, this town was built with, shall we say, higher architectural and aesthetic standards than the usual Soviet constructions. It was a “closed town” forbidden to foreigners or even most Estonians. What a rich trip this was. Thank you again to Olev, Ingrid and Mare. 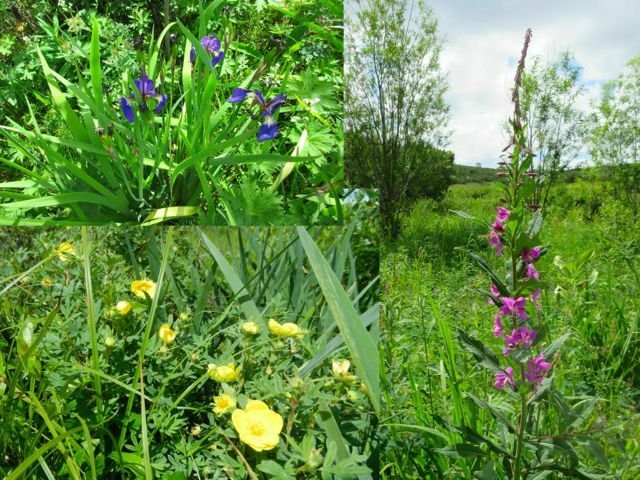 In the summer of 2009 I had a field adventure in Russia. It was an extraordinary time. I learned considerable amounts of Russian geology and paleontology, of course, and was immersed in the Russian geological culture. Along the way I collected the above unusual brachiopod. We are looking at its posterior (where the articulating hinge is), with the ventral valve below and dorsal valve above. 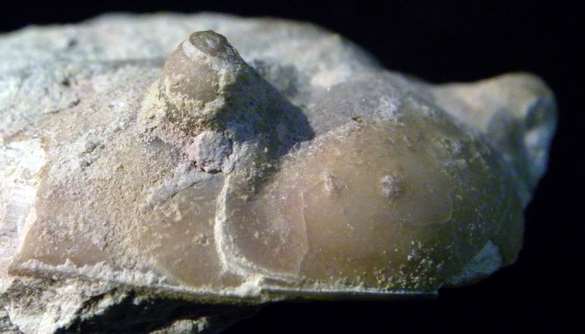 This is the anterior view of the same specimen showing the junction between the valves (the commissure). The brachiopod is Ladogia Nalivkin, 1941, a rhynchonellid from the Upper Devonian (Frasnian) of the Central Devonian Field somewhere along the Syas River in the Leningrad Oblast of western Russia. 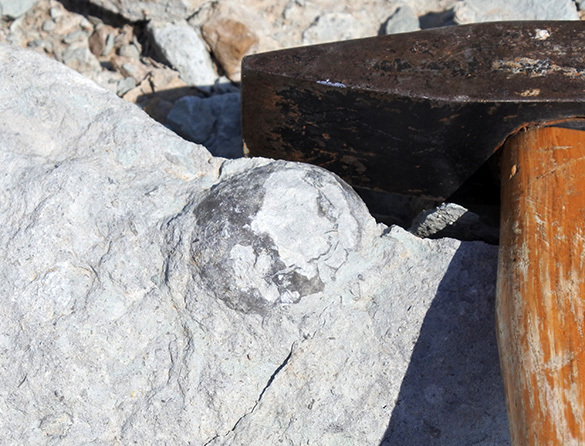 We can immediately see that this brachiopod is very tall for its kind, with a strongly defined fold (the top part of the “anticline” in the dorsal valve) and sulcus (the lower folded surface in the ventral valve). Note that the sulcus has several encrusting organisms, including eroded microconchids. 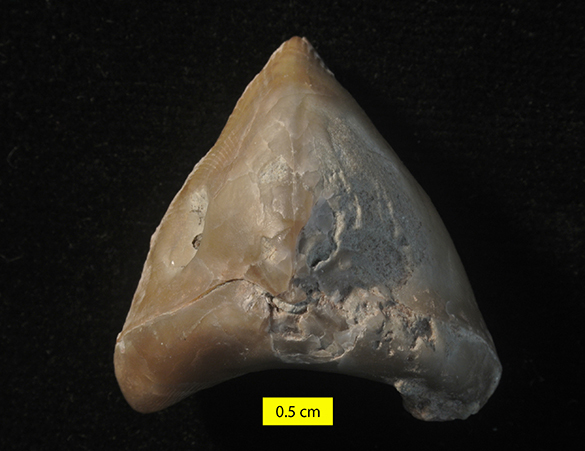 The side view shows the dramatic upward sweep of the dorsal valve and the fine radiating ornamentation. The tall fold was effective in separating the incoming water for filter-feeding from the outflow of filtered water, essentially functioning like a chimney. 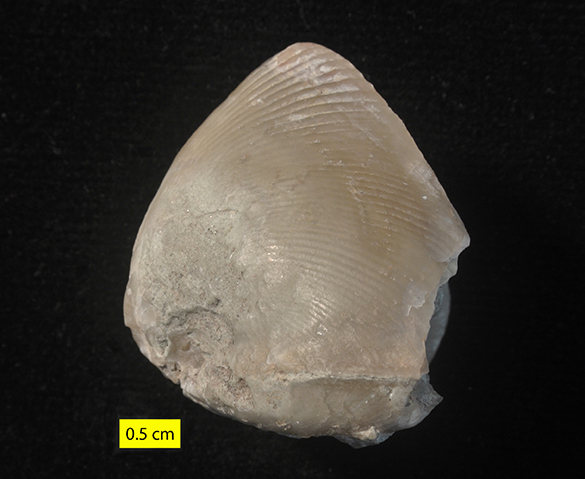 Many brachiopods have such a fold and sulcus, but few have a set of such amplitude. Ladogia was described by Dmitrii Vasil’evich Nalivkin (1889-1982) in 1941. Nalivkin was a Soviet paleontologist and geologist born in 1889 in St. Petersburg. 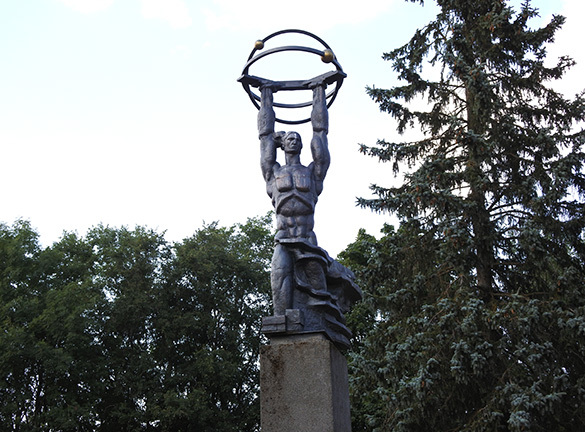 He graduated from the Institute of Mines in Petrograd (the name was changed from St. Petersburg) in 1915. In 1917 he joined the Geological Commission of Russia, staying a member through its many changes for over six decades. In 1920 he became a professor at the Institute of Mines after, we presume, the political situations from the Great War, the Bolshevik Revolution and the Russian Civil War calmed down. He is notable for giving the first lecture series on facies theory in the USSR in 1921. After World War II he was chairman of the Turkmen section of the Academy of Sciences. In 1954 he was made chairman of the Interdepartmental Stratigraphic Committee of the Academy of Sciences of the USSR. In 1954 he was appointed chairman of the Interdepartmental Stratigraphic Committee of the Academy of Sciences of the USSR. 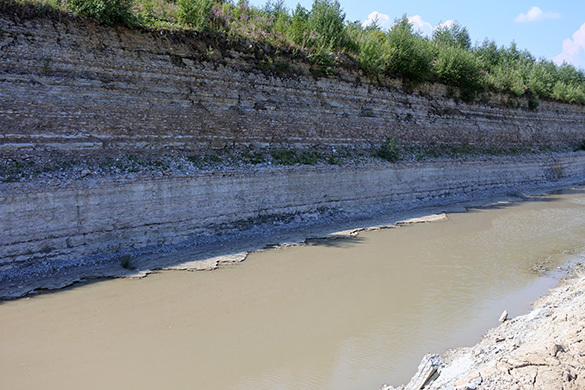 Nalivkin specialized in stratigraphy and paleontology of the Paleozoic, especially the Devonian and Carboniferous. He is best known for his geological maps of the USSR, for which he received the Lenin Prize in 1957. Here’s a man who saw a lot of history in his time. Nalivkin, D.V. 1941. Brachiopods of the Main Devonian field. Akademii Nauk SSSR Trudy 1: 139-226. Sokiran, E.V. 2002. Frasnian-Famennian extinction and recovery of rhynchonellid brachiopods from the East European Platform. Acta Palaeontologica Polonica 47: 339-354. Zhuravlev, A.V., Sokiran, E.V., Evdokimova, I.O., Dorofeeva, L.A., Rusetskaya, G.A. and Malkowski, K. 2006. Faunal and facies changes at the Early-Middle Frasnian boundary in the north-western East European Platform. Acta Palaeontologica Polonica 51: 747-758. From the Russian wilderness to the big city! Arriving in Moscow was a sharp return to reality. Suddenly all of the things that had come to feel normal while we were in Kamchatka – the winding gravel roads and little towns with random meandering livestock that would peek in your windows – were replaced by traffic jams and the overwhelming immensity of the city! One unique experience in Kamchatka was shopping. Shopping, like everything else in Russia is a very long, arduous process that takes hours longer than it should. Above is shown a typical store in Kamchatka. 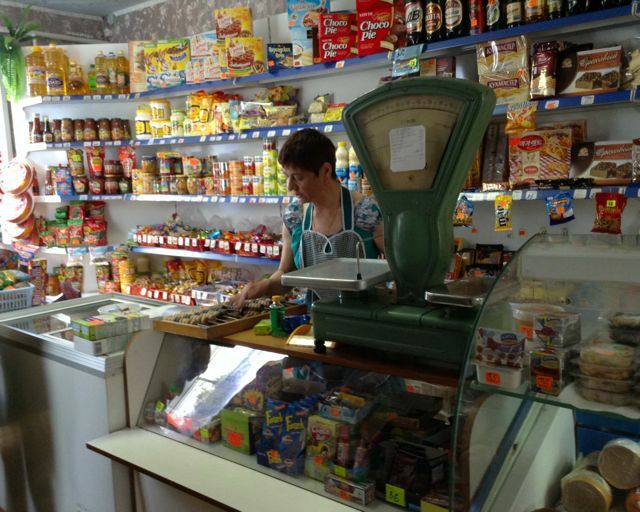 All of the goods are located behind the counter, so each item had to be individually requested from the shopkeeper. However, in all likelihood the first shop you visited would not have half of the items you required, so you would have to visit two or three additional establishments to find everything you needed. Even so, simple necessities like bread or beer were not always available. Also, take note of the high tech abacus being used! The items we purchased were also completely foreign to me. While I was initially pretty skeptical, everything was quite tasty if you had an expert cook like Tatiana to prepare it! 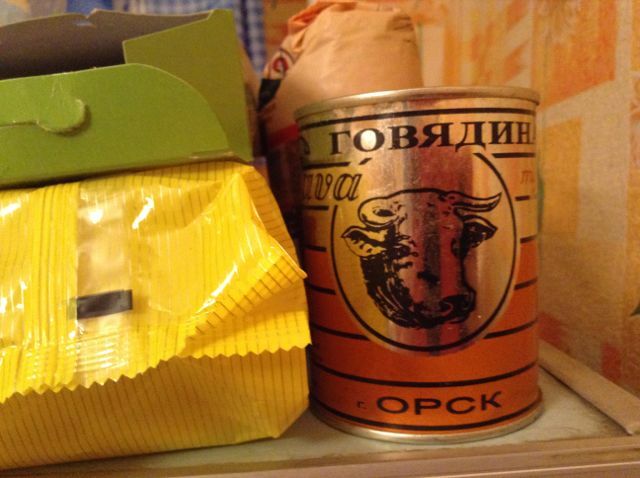 Cow-in-a-can anyone? More commonly referred to as Tushonka. There are a variety of culinary influences present. Lots of Uzbek cuisine, but we also encountered Georgian, Russian, and Ukrainian dishes. 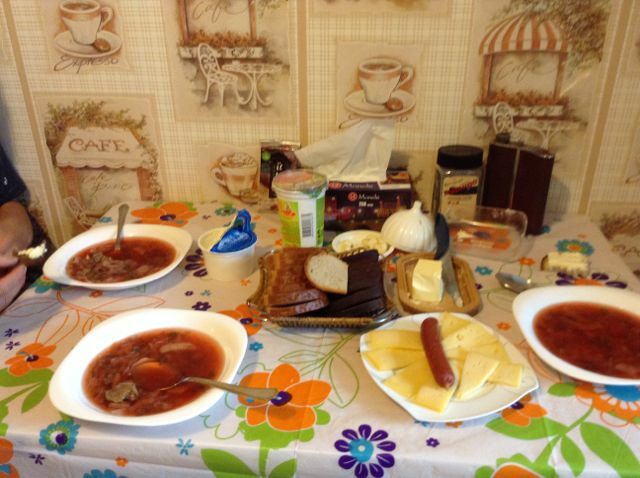 A common afternoon meal with borscht, beat soup of Ukranian origin, is pictured above. 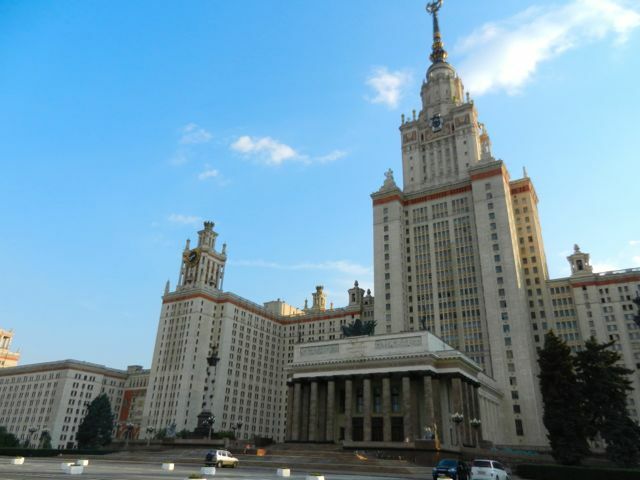 While in Moscow we toured the Institute, a towering majestic building, one of seven built around the city, which houses several departments of Moscow State University, a museum, faculty and students. An apartment in the wing to the right was actually our home for the duration of our visit. 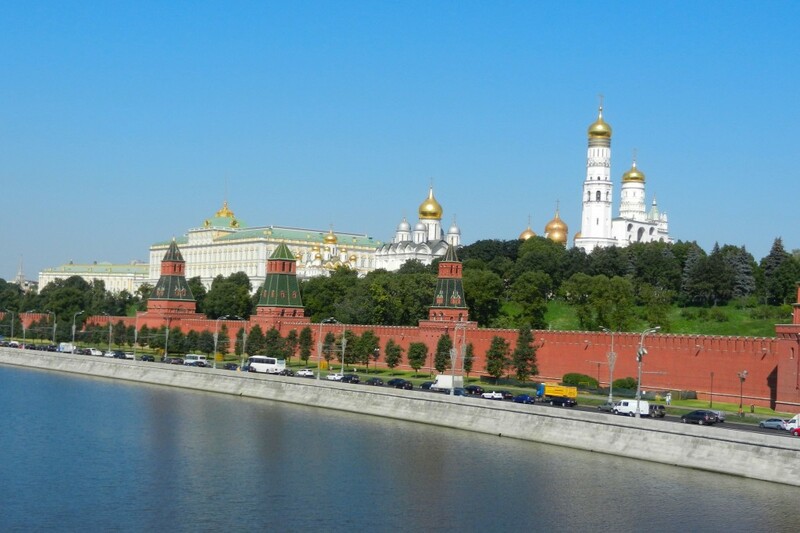 While in Moscow we of course visited the touristy section of the city. Dr. Wiles with our two hosts, Olga and Vladimir in front of St. Basils. 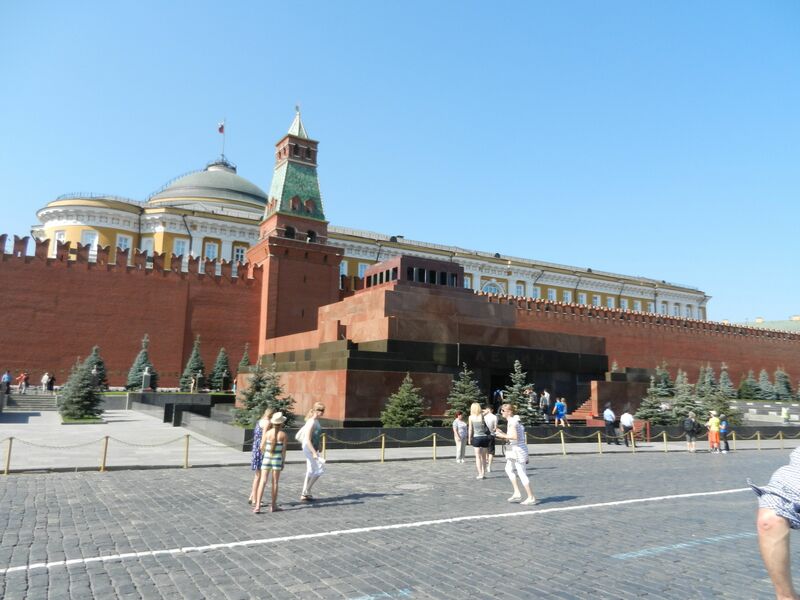 One of the prominent monuments on the Red Square is Lenin’s tomb. He has been on public display since shortly after his death in 1924. One last picture from Kamchatka. Thanks for following us through our journey! We look forward to reporting on our findings from the lab soon! Coring larch trees in the mountains of the Eastern Range. 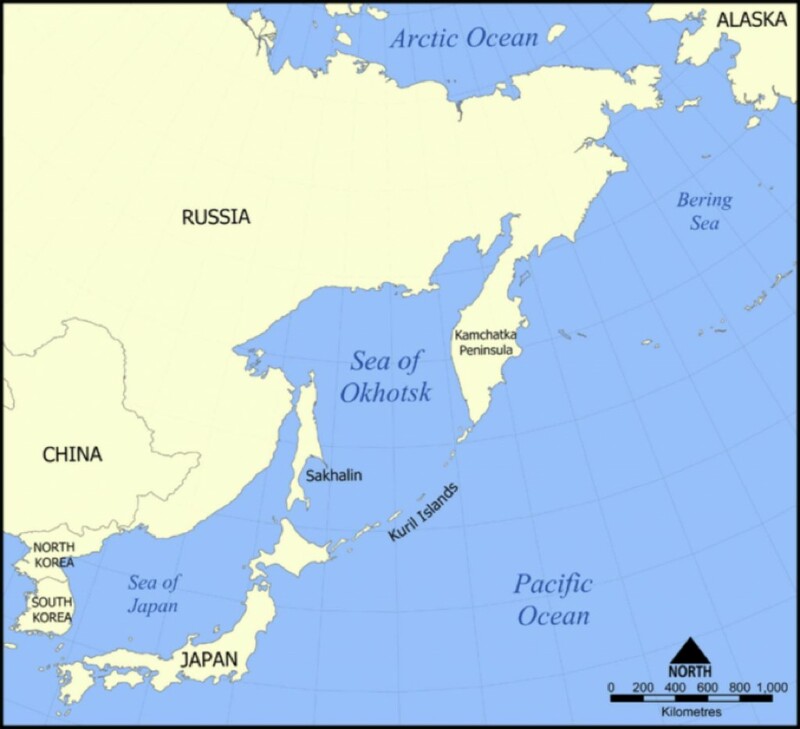 Coring took us to every reach of the Kamchatka Peninsula. We made our way as far north as Ust-Kamchatsky, a port city that was strategically important during the Cold War when the entire peninsula was closed to nonresident Russians and foreigners alike. Then we drove all the way west to the Sea of Okhotsk before returning east to Petropavlovsk, a large port city on the Pacific. During our travels we have explored a variety of environments. While the most pervasive by far was the taiga, swampy coniferous forests, we also appreciated the beauty of spring in the tundra. The devastation caused by the frequent volcanic eruptions was also evident. 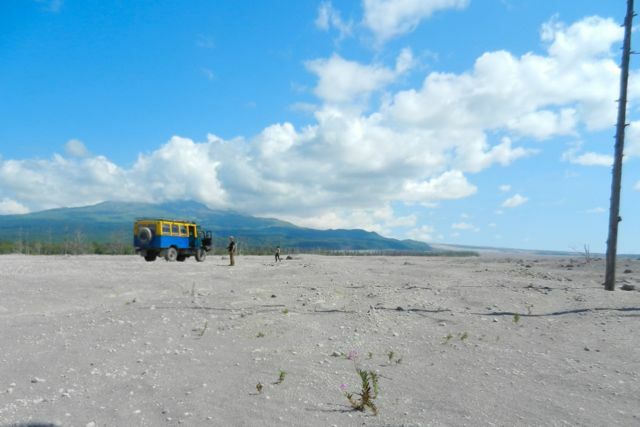 We frequently came across open ash fields and even pyroclastic flow deposits! The desolate remains of a pyroclastic flow (fast moving current of hot gas and rock) produced by the adjacent volcano. Besides collecting cores, we also learned a bit about the local culture and history. 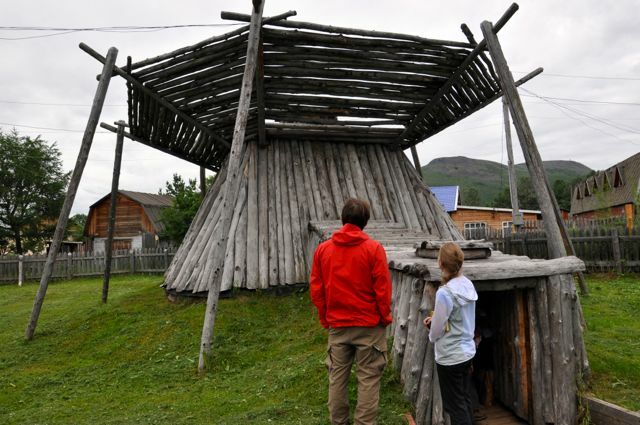 In Esso, we visited the museum where we learned about the traditional practices of the indigenous peoples and how they survived Kamchatka’s harsh climate. The main building of the museum exhibits the beautiful woodwork typical of the region. 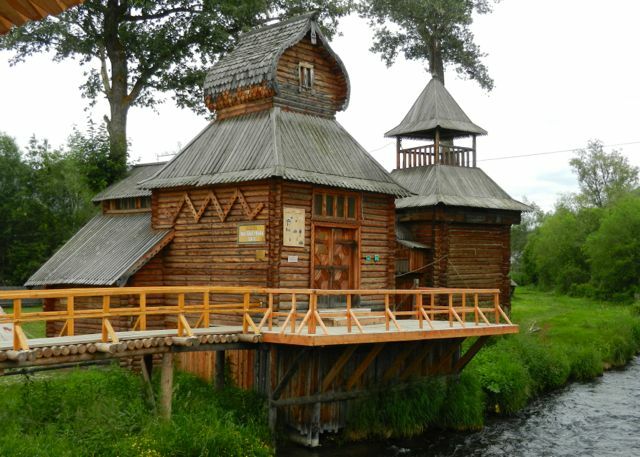 A reproduction of a traditional home of the Koryak people. In order to optimize heat retention, the structure is built partially underground and in the shape of an oven. It even has an escape hatch out of the top for when snow buries the structure. Esso is also significant as the starting point of the Beringia, Kamchatka’s traditional dog sled race, which in the 1990s held the record for the longest dogsled race, rivaling Alaska’s Iditarod. Finally, for those have been asking about the bears. Here is a cutie that we came across on one of our last days in the field. These Kamchatka brown bears are very large, though not a big threat to humans, particularly in the summer when food is plentiful. Volcanoes, Mosquitoes, and Bears, Oh My! After three weeks in Russia it sure feels great to be back on US soil! Since we didn’t have internet access during this expedition, our blog posts come a bit delayed. Here is a bit about our first week in Kamchatka: If, like me, you have never played the board game Risk, you likely have never heard of Kamchatka. So to give you some context of where we are, below is a map of the North Pacific. As you can see, this peninsula, part of the Pacific Ring of Fire, is further east than Siberia and it is not far from Alaska. However, since flights between Alaska and Kamchatka are extremely limited, we were forced to fly the long way around. After our nearly 40hr journey, crossing 16 time zones, it was a relief to arrive in Petropavlovsk, Kamchatka. Above is a picture taken on top of an extinct volcano that overlooks the city. 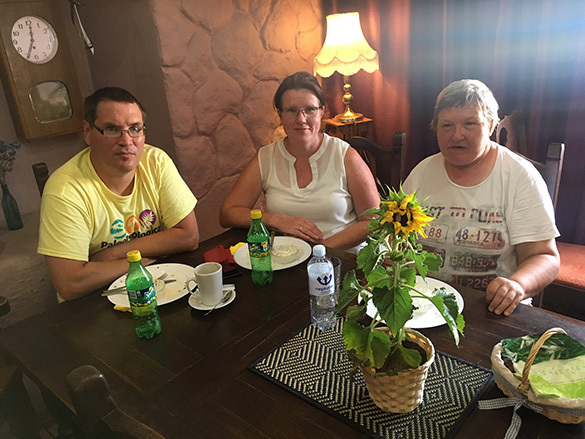 From L to R, Tatiana Kuderina (Senior Researcher at Moscow University), Sarah Frederick (’15), Vladimir Matskovsky (Researcher at Moscow University) and our lovely host Tatiana. This picture is an achievement, because as you will notice, it is the only picture in which all of the Russians are smiling! 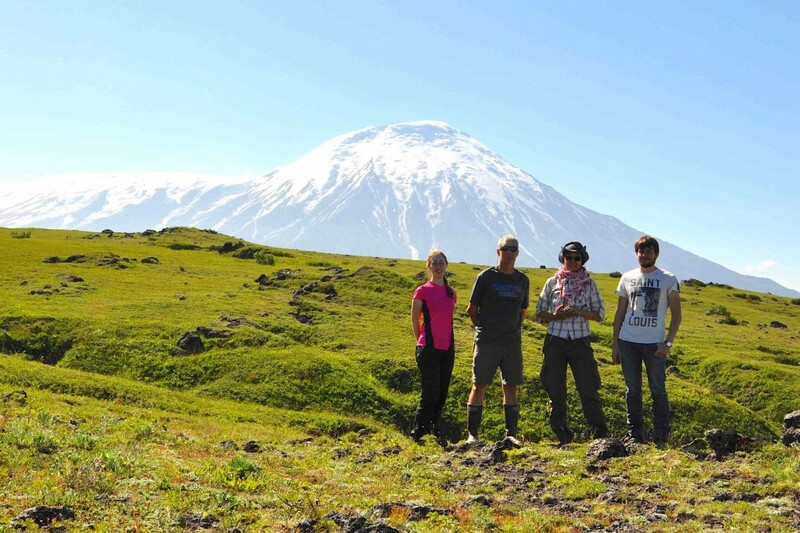 We were greeted in Kamchatka, the land of many mosquitoes, bears, and volcanoes, by scientists from the Volcanology Institute. And after a day of recovery we headed north into the great wild. While there have been no bear attacks, just three sitings so far, we were lucky enough to witness a small volcanic eruption during one of our expeditions! 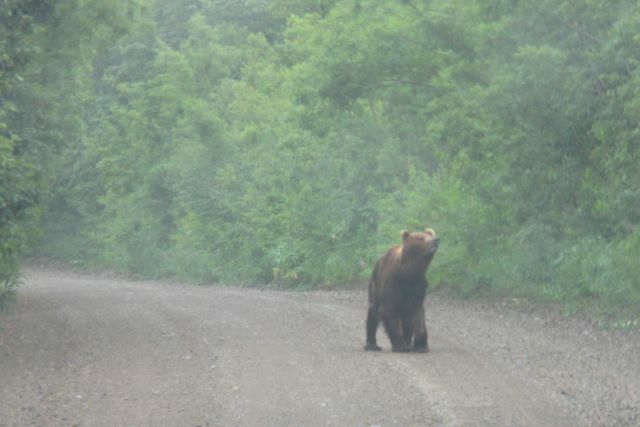 Though described in the literature as ‘pristine’ and ‘untouched,’ over the past week we have found much of Kamchatka far from that with the forests along the single main road (unpaved dirt and gravel) having been clear cut. Even so, with a lot of help from our driver, Vasily, and his mighty passenger truck, we managed to locate old growth larch in the north. While our quest for trees has required us to spend extensive time in the swamps being devoured by millions of mosquitoes, we also made it to some of the more picturesque parts of Kamchatka as well. The highlight thus far was our trekup the Tolbachik volcanic complex where we were greeted by unseasonably clear weather. Not only could we see the majestic glacier topped volcanoes of the Eastern Range, but to the west, the towering volcanoes of the Median Range were also visible! We are now heading south for our last few days of tree hunting. 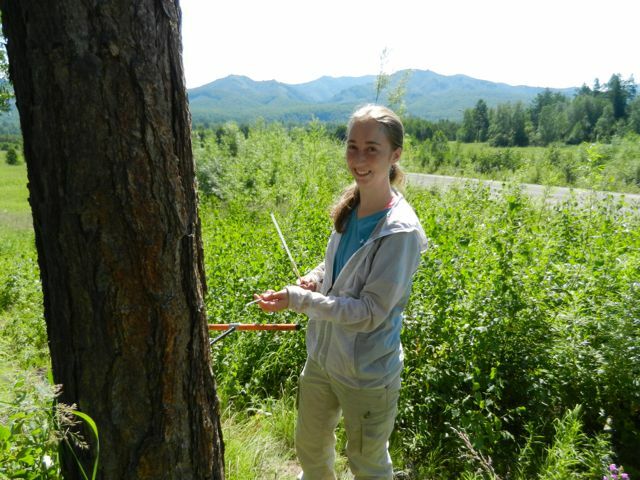 It is our hope that the tree ring data that we are collecting will help to connect the extensive network of tree ring chronologies developed for the Gulf of Alaska with those from the West Pacific. Helping to develop a better understanding of North Pacific climate. We are currently finishing our first leg of field research on Sakhalin Island, Fareast Russia, and today we are traveling to Vladivostok to stage the next two weeks of sampling climate-sensitive trees. This is collaborative Wooster project funded by NSF with Kevin Anchukaitis (Woods Hole Oceanographic Institute) and Rosanne D’Arrigo (Lamont-Doherty Earth Observatory). 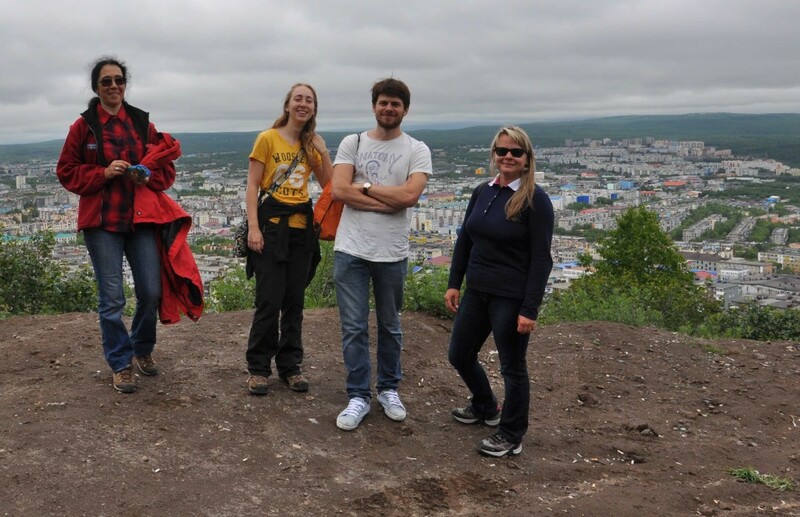 Our Russian collaborators include Olga Solomina (Russian Academy of Sciences), researchers Ekaterina Dolgova; Eugenio Grabenko Vladimir Matskovsky, Tatiana Maratovna Kouderina and our host on Sakhalin, Yury Gensiorovskiy. 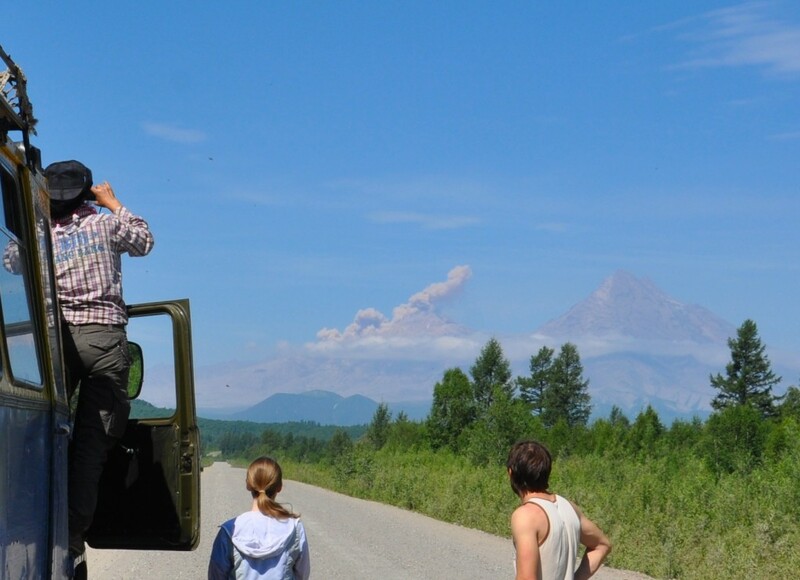 Future Wooster student projects will include work on the Kamchatka Peninsula, the Sikhote-Atlin Mountains and the Kurile Islands. 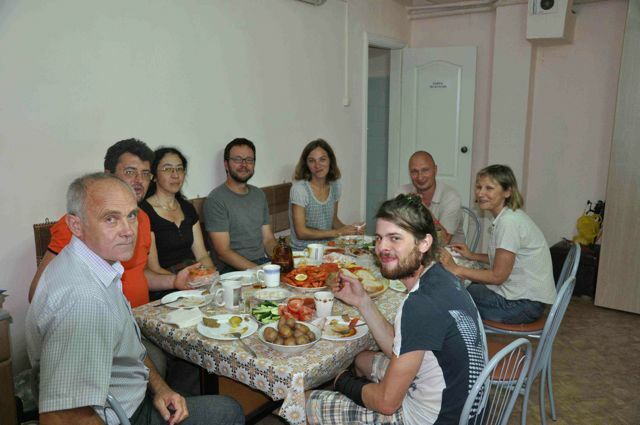 The team at our final dinner at the Far East Branch of Geological Institute in Yuhzno-Sakhalinsk. 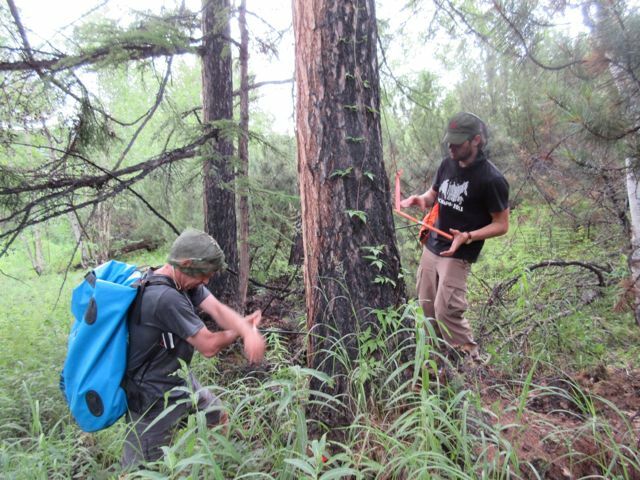 The group split into two teams to find old and climate sensitive trees on the Island. My group traveled with Victor (above) who ably drove us in the Gas66. 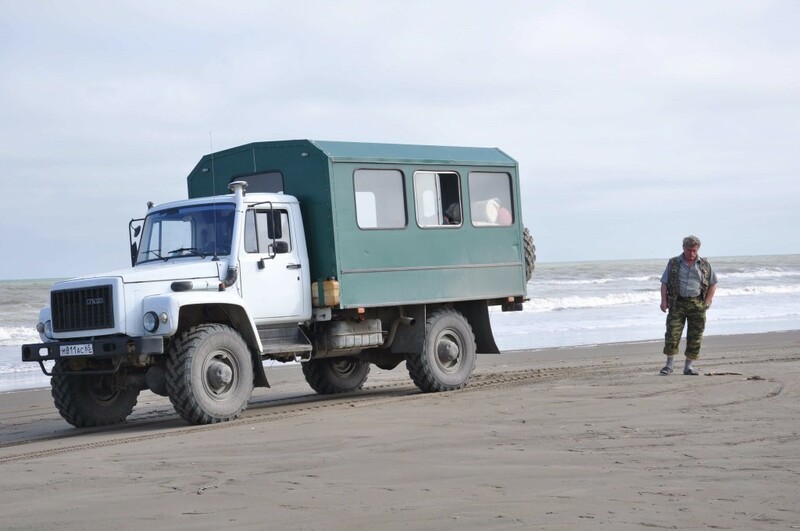 Here Victor takes a break on the shore of the Sea of Ohotsk. 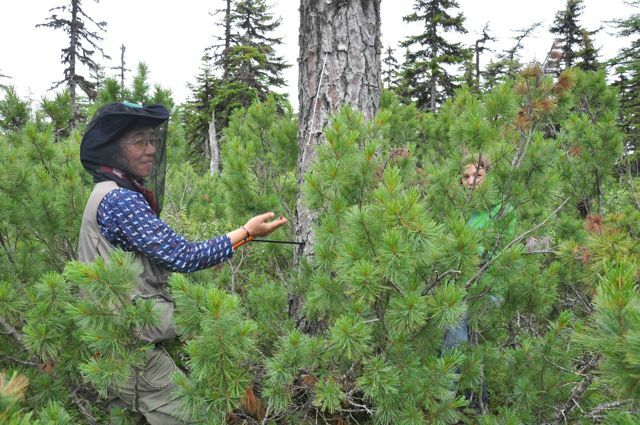 Tatiana (originally from Kazakstan) cores a an old larch in a sea of Pinus Pumulus. This site is on the northern most part of the island – the Smit Peninsula. 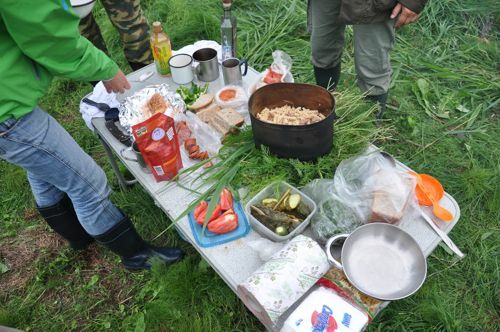 Camp near Nogliki. Olga and I sampled the larch site near here ten years ago and the group updated this important site by re-coring the trees. This view is of the many pump jacks and oil wells near Oxa. There are many strong landscapes on the island attesting to an extreme history of logging, oil and gas, fire and political upheaval. In spite of this there are many pockets of old growth forests remaining in beautiful settings. The large of local foods including a full range of sea food makes for excellent dinners after a long day. 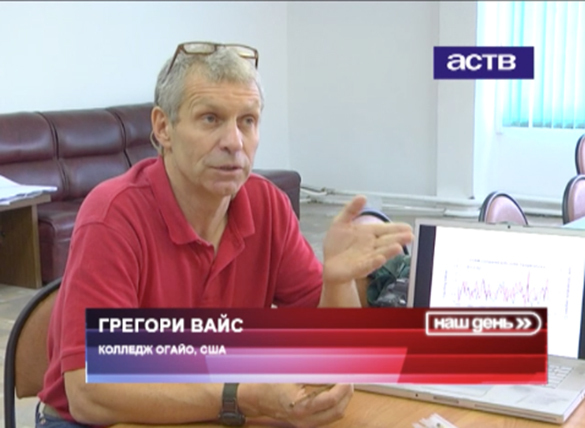 Wooster Geologist in the Far East of Russia — and on Russian TV! 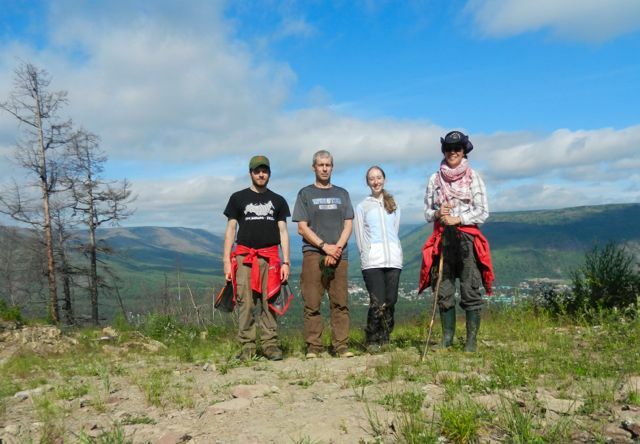 Dr. Greg Wiles, the Ross K. Shoolroy Chair of Natural Resources at Wooster, is currently on an adventurous dendrochronology research trip to the Far East of Russia, including Sakhalin Island. He will have much more to say about it on this blog when he gets the chance. In the meantime, his wife Theresa Ford sent us this link to a Russian news video about his team and their work. The connection is awkward — the video only works for me on my Safari browser — but it is worth the download time to see our Dr. Wiles explaining those wiggly lines and soda straws filled with wood. 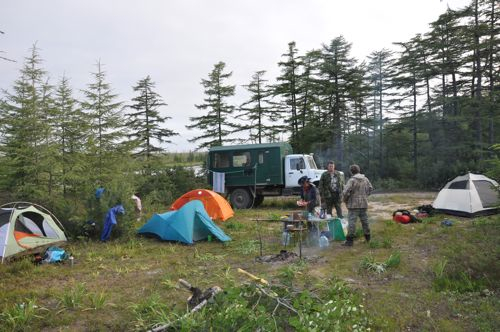 There is also a summer 2004 story in Go Nomad touching on Greg’s previous expedition to Sakhalin Island. Theresa found this too, and it was new to me. Here’s a link to a Russian Academy of Sciences page about that earlier research. It has some nice photographs. 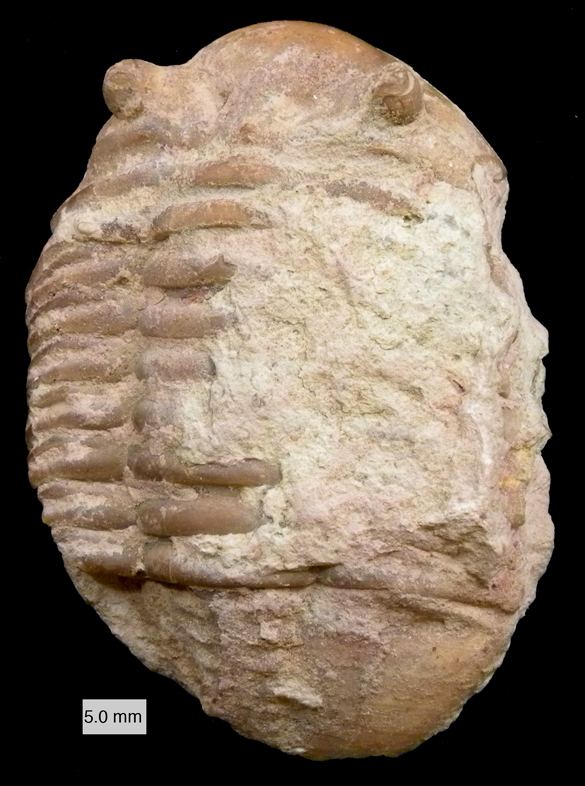 This is the asaphid trilobite Asaphus lepidurus Nieszkowski, 1859. This group is known for having fantastic eyes, some on long stalks and others with calcareous “eyeshades” above them. This species has more conventional eyes, but they’re still cool. A. lepidurus studies us with a cold, dead eye. From this perspective the facial suture is visible as the curved, raised line running from the near eye to the periphery of the cephalon (head). This is a line of weakness the trilobite used to split its exoskeleton for molting (ecdysis). These sutures often have diagnostic value for distinguishing trilobites, especially at the species level. A. lepidurus was first described and named by Jan Nieszkowski (1833-1866), a Polish paleontologist (and naturalist and medical doctor). He was born in Lublin, Poland, son of an army captain. He studied at the University of Dorpat (now the University of Tartu in Estonia) and soon became an avid and productive paleontologist. He then participated in the January Uprising of Poles against the occupying Russians in 1863. He was captured and exiled to the Russian city of Orenburg, where he died at a young age of typhus. This little trilobite brings back memories of my Russian adventure, and it is also a reminder that science is never done in a political vacuum. Here’s to the Polish patriot and scientist Dr. Jan Nieszkowski. Dronov, A., Tolmacheva, T., Raevskaya, E., and Nestell, M. 2005. Cambrian and Ordovician of St. Petersburg region. 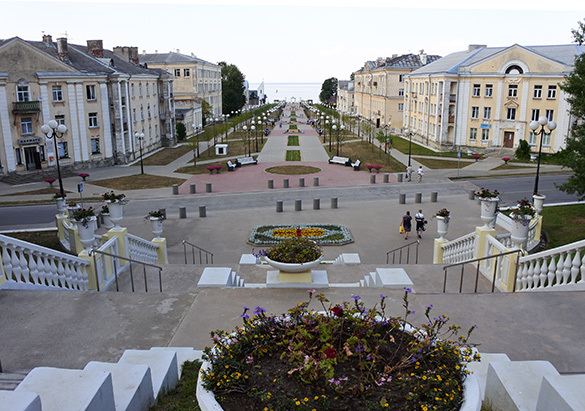 6th Baltic Stratigraphical Conference, IGCP 503 Meeting; St. Petersburg, Russia: St. Petersburg State University. Ivantsov, A.Y. 2003. Ordovician trilobites of the Subfamily Asaphinae of the Ladoga Glint. Paleontological Journal 37, supplement 3: S229-S337. 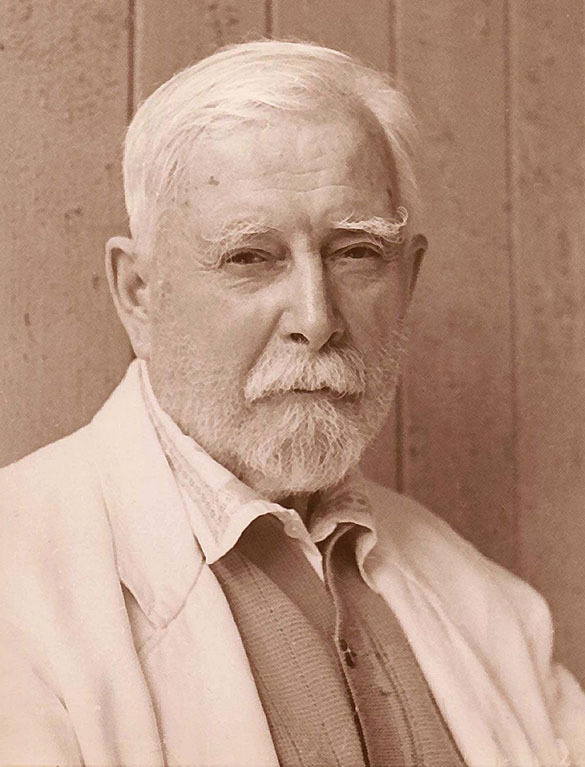 Nieszkowski, J. 1859. Zusätze zur Monographie der Trilobiten der Ostseeprovinzen, nebst der Beschreibung einiger neuen obersilurischen Crustaceen. Archiv für die Naturkunde Liv-, Ehst-, und Kurland, Serie 1: 345-384. This small fossil was completely new to me when I found it during my research trip to the Ordovician of Russia in the Fall of 2009. 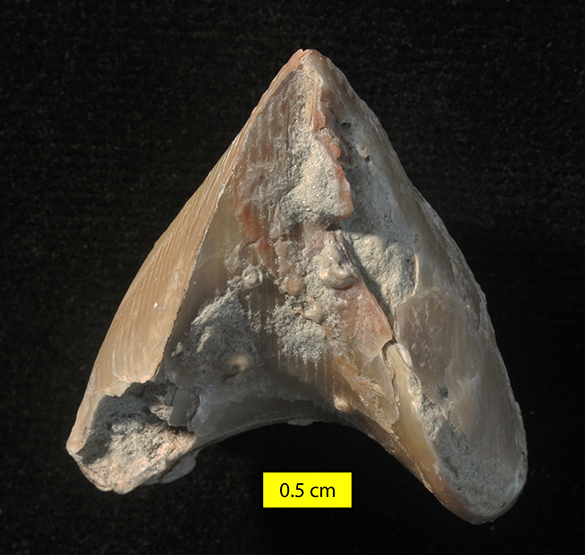 A side view is shown on the left of this conical skeleton, and the top view is right. I could tell it was an echinoderm because it has a characteristic structure in its calcitic skeleton known as the stereom (a network of tiny passageways inside the crystals). Other than that, it was a mystery to me. My Russian colleague Andrey Dronov showed me that it is of the genus Bolboporites, a strange relative of the crinoid found only in the Ordovician of the Baltic Region and North America. As you can see in the reconstruction on the right below, it probably lived in the sediment as an upwardly-flaring cone with a single feeding arm (the brachiole) collecting suspended organic matter from passing water for food. In the fossil view above and right, you can see the hole where the missing brachiole fit; inside of that you can just make out an opening that is likely the mouth. Bolboporites likely originated on the paleocontinent of Baltica and then migrated to North America. As far as I can tell it is vanishingly rare over here — I’ve never seen Bolboporites before in the field or in collections. Now Wooster has one of the very few of these little treasures. Rozhnov, S.V. 2009. Eocrinoids and paracrinoids of the Baltic Ordovician basin: a biogeographical report. IGCP Meeting, Ordovician palaeogeography and palaeoclimate, Copenhagen, p. 16. Rozhnov, S.V. and Kushlina, V.B. 1994. Interpretation of new data on Bolboporites Pander, 1830 (Echinodermata; Ordovician), p. 179-180, in David, B., Guille, A., Féral, J.-P. & Roux, M. (eds. ), Echinoderms through time (Balkema, Rotterdam). TALLINN, ESTONIA–On my last evening in Estonia this year I finally had time to figure out how to post some of the short video clips I’ve taken over the past several weeks. The Iceland group pioneered the concept on this blog with their excellent Great Basalt Race. I can’t come close to matching that excitement, but since we have this cool equipment I might as well display the results! These clips are also now included in the appropriate blog posts. First, going back to the May work in Israel, here is a brief view of some girls dancing just outside the Old City of Jerusalem. Next is a simple pan from outside Andrey Dronov’s cottage in Russia looking at the Lynna River. Then sailing into pack ice in Isfjorden, Svalbard, Norway. Soon afterwards I filmed waves lapping on an iceberg in the same area. Finally, today we saw some Medieval dancing in the town square of Tallinn, Estonia. I’ve also uploaded a couple of very short movies from the 2005 Wooster Israel expedition: Yoav Avni explaining some geology at Makhtesh Ramon, and Jeff Bowen collecting in Makhtesh Gadol. No Oscars coming my way for these, but maybe a little flavor of these places is conveyed by the sound and movement. The clips are also mercifully short!